Why rent when you can buy? The argument for marketing platforms. In my last post, I argued that Facebook’s decision to shift their news feed algorithm away from publishers’ posts and back towards friends’ and family members’ posts should encourage marketers to build platforms as a hedge against changes that might hurt them. Solid advice. Now what the hell is a marketing platform and why should marketers invest in one? In terms of description, a marketing platform is a long-term marketing initiative, often but not always digital, that engages customers and prospects at one or more points along the customer journey in a brand-owned space. Let me emphasize that last point about a brand-owned space. In some ways, platforms work like branded content in reverse; rather than engage consumers in a trusted publisher’s space, platforms build brand trust by becoming media properties themselves. 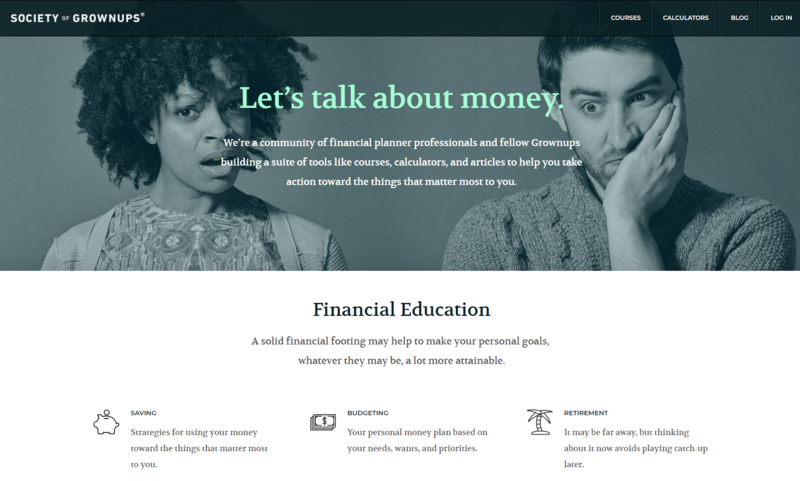 Society of Grownups speaks to a segment of recent-ish college graduates who need to start making financial decisions with lifetime consequences. Creating the Society of Grownups platform gives Mass Mutual’s content some credibility without relying on a publisher brand. They update it frequently with new articles, graphics and calculators to encourage ongoing learning. Now I have a nail gun. Ho. Ho. Ho. Home Depot has, of course, featured live tutorials in their stores for ages (and these, incidentally, serve as a great example of non-digital platforms). Putting these tutorials online might represent an obvious next step for our connected and busy world. However, they also encourage consumers and maybe even some pros to keep visiting the site and to build their trust with Home Depot. Yeah? So? Why should I spend money on one? Obviously, platforms such as these, which depend on fresh content and functionality, don’t come cheap, so why build them? In terms of the investment discussion, it helps to think of platforms as a way to buy your audience’s attention rather than to rent it. A successful platform reduces the need to acquire and re-acquire customers and prospects every time they reach the “shop” or “buy” phase of the customer journey. They keep showing up because the platform has something of value for them. Continued visits build brand trust that ultimately leads to purchase. Speaking specifically of digital platforms, they can also play a valuable role as CRM tools. At their simplest, any platform can have a “buy now” button or something similar. 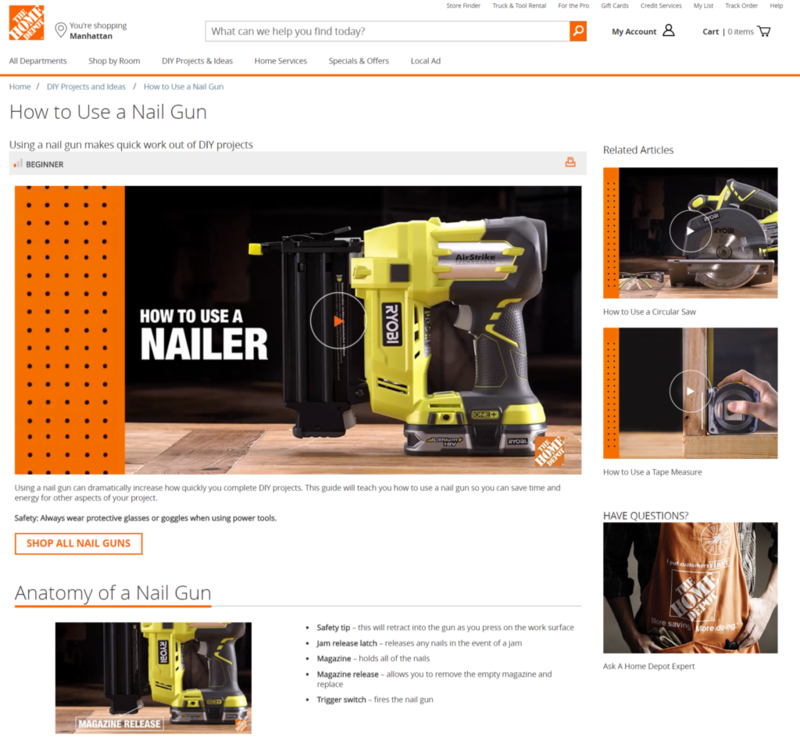 The nail gun video above has links beneath it to drive users to a nail gun buying guide that leads to product pages. 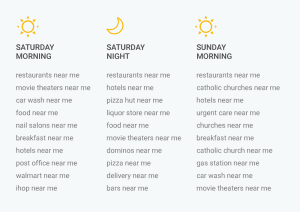 More subtle approaches can gather data about visitors (assuming proper permissions, of course) and provision them with appropriate content and offers when they display buying behavior. In a subsequent post, we’ll discuss how to build, maintain and most importantly measure the performance of marketing platforms. For now, though, think of what you could do with your audiences if they belonged to you and not Facebook. This entry was posted in Content Marketing, Digital Marketing, User Experience and tagged facebook, home depot, mass mutual, platform, publisher, society of grownups on January 26, 2018 by Ben. Why Did You Spend $5 Million on the Superbowl Again? Superbowl Monday brings out America’s platoon of ad critics, who discuss which ad had the best joke, the cutest baby/animal and strongest political point. Rarely, however, do they discuss what the advertisers got for the trouble of spending a reported $5 million on a 30-second spot. As of this morning, the product page for the Kia Niro has a module with still from the Melissa McCarthy ad that lets you watch it again. Why not some information about environmental or nature causes such as the ones espoused by McCarthy in the ad? The NFL page has no mention of the ad with the babies in it, which seems odd for an organization that’s struggling to promote youth football. Bud’s immigration story ad features heavily on the brand’s home page today but has no follow-up, such as Adolphus Busch’s real story or Anheuser-Busch’s pioneering role in American brewing. Let’s talk about one advertiser who got it right with, ironically, the most controversial ad of the night, 84 Lumber’s “Journey” ad. This entry was posted in Branding, Digital Marketing and tagged 84 lumber, anheuser-busch, atlanta falcons, budweiser, dorothea lange, home depot, immigration, kia niro, melissa mccarthy, migrant mother, NFL, recruitment, superbowl, youth football on February 6, 2017 by Ben. The problem with analyzing data for a living is that you begin to look for data-driven decisions in EVERYTHING. ¡Por ejemplo! Home Depot’s plastic bags. I bought some flying insect killer at HD today. More specifically, I patronized their West 23rd Street store in Manhattan. That’s when I noticed unusually thick plastic bags. WAIT, NO! DON’T GO! IT GETS MORE INTERESTING! Rightfully reviled as they are, sturdy plastic bags mean a lot to city dwellers, at least the ones who don’t own cars. Schlepping groceries, school supplies and whatnot down the street, on the bus or into the subway really brings out the bags’ value. For drivers, cheap bags mean, at worst, spilled oranges in your trunk. 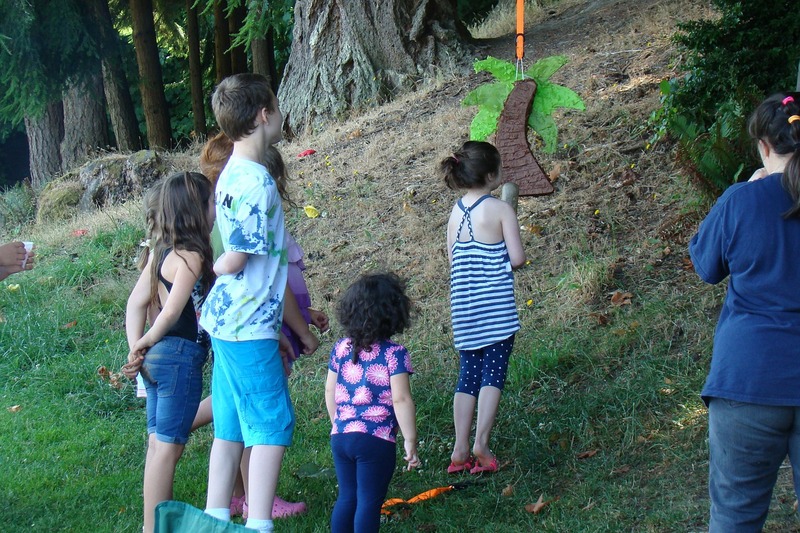 For pedestrian shoppers, it means piñata time. Here’s the thing: I used to visit Home Depot’s 59th Street store all the time, the one where Alexander’s used to be. Those bags, and the ones I’ve gotten at suburban HDs, seemed cheaper. The data nerd in me wants to believe that someone at HQ in Atlanta, someone used credit card data to measure distances from home or business addresses of purchasers to the address of the store where they purchased and then used a proprietary algorithm to determine which stores need heavier bags. OK, HD can’t possibly work this way, but a fella can dream, can’t he? This entry was posted in Data and tagged data, flying insect killer, home depot, manhattan on May 20, 2015 by Ben. 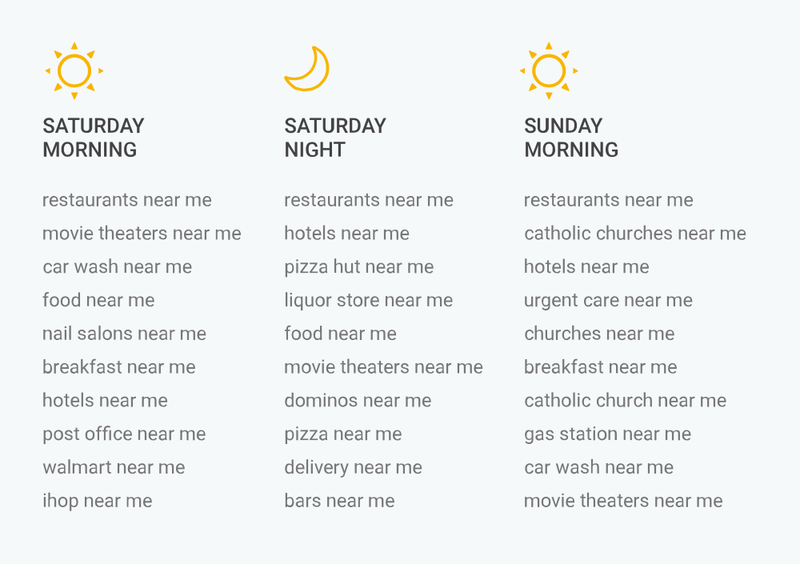 Here’s an eye-popping stat: since 2011, Google searches including the phrase “near me” have increased 34 times. Not 34 percent, but 34 times. I read this figure as a nail in the coffin of distinct and discrete mobile and local strategies. Put another way, your brand has a mobile and a local strategy whether you’ve planned it or not. Brands need to prepare for the inevitable “gotta have it now” factor across channels. I wonder, do people search for liquor stores before or after hotels on a Saturday night? This entry was posted in Behind the Numbers, Data, Digital Marketing, User Experience and tagged advertising, billboard, google, home depot, local, lowe's, mobile, near me, phone, search, toilet, tv on April 16, 2015 by Ben.